The image in the step here shows an example of an In Form Report showing in an Event Form on the Mobile Application. The Table rows appear with the data and the athlete they are entered for. 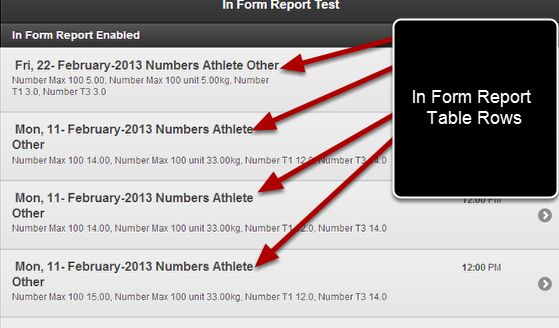 Underneath the row headings, all of the fields selected to appear in the In Form report appear. For this example we will open the record for the 22nd February. 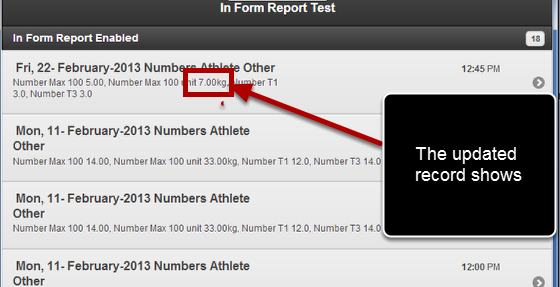 You can see that the In Form Report Form must be mobile enabled or it couldn't be accessed via the Mobile App. 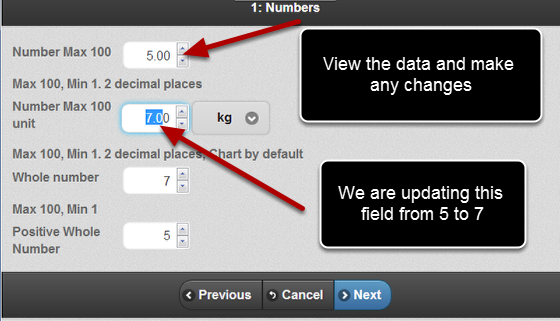 You can click to view the record, edit it and save changes if required. Navigate through the form using the Previous and Next buttons. Click Cancel to go back to the In Form Report at any time. Alternatively, you can edit the form (the field Number Max is being changed from 5 to 7) and click on Save and Close, the changes will be saved and you will return to the In Form Report in the original Form that you were in. The field that was updated when we were viewing the actual record from the In Form Report has been updated. 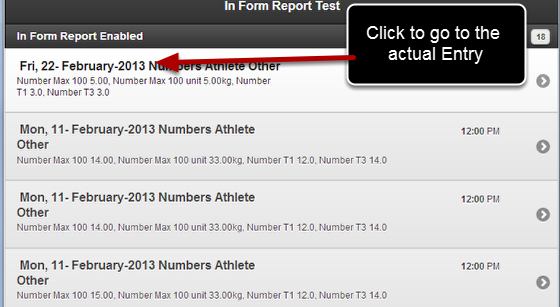 At the bottom of the In Form Report you can move to the next section and navigate through the rest of the Event Form.